Smithfield pork is about to be purchased–lock, stock, and barrel–by a huge, formerly state owned Chinese company. The NYT reported the story in the Business section over several days this week. The company aims to bring pork into China where citizens love that meat. The back stories are more interesting. For one thing, Chinese meats–including chicken and duck–are not permitted into the U.S. because of concern about the hygiene, from birth to slaughter to storage to shipping, but by buying Smithfield it may be that China gets “a foot in the door” and argues that because they have a U.S. based company that their Chinese products can be sold here. The FDA is opposed, for reasons noted, and does not have the labor force to inspect the products. Here’s what I found most interesting: You know how when you go to a store and look at a package and can see where it’s from? You know how you might not buy a food product made in China because of the criminal behavior that goes on in adulteration of these products? Right. Well, restaurants have no legal obligation to list where their food is from. So when you are in a restaurant and have fried fish, salad dressing, a soy product, rice, dried mushrooms, noodles, and so on? It may come from China, and that places you at greater risk health-wise. Read the Business sections…that’s where the food stories are best. The isolation experienced by chefs is reflected in the food. Food that is fried, heavily salted, high in fat, very colorful, and either served in huge portions or in miniature, like works of art, so that the customer understands that the cooks, often wearing tats as sleeves, bearded, enraptured by heavy metal or rap, are inviting you to a party. It’s the kind of food that people love when they’re drunk or stoned. Chefs aren’t intoxicated, but they understand what makes people happy, and that’s food which isn’t complicated, has an immediacy, and is so rich in flavor that every bite is as good as the one before it. Stoner cuisine is found in high end and hole in the wall restaurants: Pork belly, trotters, tails, and all kinds of guts. Even healthier stuff, from the sea, is doused with hot sauce or double fried or plated atop as many as a dozen spices. This is the culinary version of the chef saying that he’s cool and you’re not. Bonus: Customer get so thirsty, they drink more. Best of all, it’s wartime cooking: Shock and awe. Stoner Cuisine really took off in this country, at just around the time when the U.S. invaded Iraq. The chef wants to shock you. He wants you to be in awe of his food. Me, I’m waiting for food cooked at times of peace, with less noise and drama, and more attention paid to the way things taste. People writing about food note restaurant trends: Vegan menus, local farmers, seasonal ingredients, artisanal products, and molecular techniques, and, sure, all of these are either new or more prominent than ever. But the real trend is: Who’s behind the stove? Long before the profession was celebrated, chefs were working guys who lived a subterranean life, drove their staff nuts, never saw their wife and kids, and slaved to perfect dishes that would make customers swoon so that they might forget their troubles and spend lots more eating out than cooking at home. OK, so not much has changed. What is different is how chefs have asserted themselves into the cuisine. We’re no longer eating classic dishes or interpretations at the trendiest restaurants. Now it’s “signature” items which reflect the chef’s personality and, Lord help us, his outlook on life. The high toned sentences describe sensuality and respect for nature, a recognition of the importance of communities, and lots of verbiage about conviviality and love and timelessness. Read the poetic prose carefully and you’ll realize: This is the language of people living in their own world. Yeah, I know what you’re thinking: It’s Tuesday, but it feels like Monday, right? Well, that’s because it was a national holiday in the U.S. yesterday, and not to be overly nationalistic, but here it feels like Monday whereas if you’re reading this in another country it feels like Tuesday. Life is so confusing at times. But that’s how it should be. Complexity breeds versatility. Meanwhile, in a more focused manner, I’m gathering information for what may be a book I’ve been asked to write on Japan–its rice–and giving serious thought to soft shelled crabs, toro, and cold white wine. I’m fascinated, too, by the challenge of distraction and complacency, the ways in which habits take the place of trying new things, and all the bunnies I’ve spotted today and the past few days in the neighborhood. Added to which the loss of the architectural splendor now that the trees are leafy again. For all those who celebrate the “French way of life,” whatever that may be, which seems to be associated for some with sensuality, have a look at today’s news: http://www.nytimes.com/2013/05/27/world/europe/thousands-march-in-france-against-gay-marriage.html?_r=0. 150,000 people converged in the center of Paris to protest gay marriage. And then what? Did they dine at a lovely neighborhood bistro? Enjoy a three star meal? Shop for artisanal products at Rue Boisvert? I think that any reporting on French food and culture might also include, in addition to celebrating gustation, the deep conservatism needed to produce traditional food. Meanwhile, stateside, the lead story in today’s NYT Business section, which is where the best food stories often appear, we find this story about GMO food: http://www.nytimes.com/2013/05/27/business/food-companies-seeking-ingredients-that-arent-gene-altered.html?ref=business. What’s happening is a unique convergence of fearful and suspicious consumers and marketers who want to sell stuff to them. From Slate: http://www.slate.com/articles/health_and_science/science/2012/09/are_gmo_foods_safe_opponents_are_skewing_the_science_to_scare_people_.html. Further, most of what is used to cook or what is eaten GMO. From the article, see below. 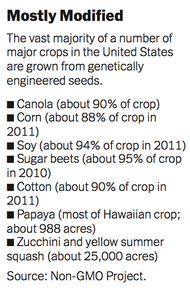 The article notes that companies are, um, cropping up that will sell non-GMO at higher cost. It’s a business plan based on consumer fear. When you buy local, the money stays in the neighborhoods, but it’s kept out of the hands of farmers in the developing world who need it most. When you buy organic, you benefit corporate control of the agriculture industries: http://www.cornucopia.org/2013/05/who-owns-organics-updated/?utm_source=rss&utm_medium=rss&utm_campaign=who-owns-organics-updated. Terms like “heirloom” or “artisanal” have no meaning outside of the marketing folks who created them. Before Nina left town, she decided to stop by with a box of beef empanadas as a going away present. I was susceptible, not having eaten since 7 A.M., and this being nearly 4 in the afternoon, and I am here to tell you that four empanadas later, I’m still here. These were delicious. Going back nearly 24 hours: I tended bar at our annual fundraiser for Project Hip Hop. I’m on the board, and each year I serve beer and wine and chat and enjoy the pleasant vibes. Moving forward: Morels, morels, and morels. And, of course, Roy Haynes in the wings, tomorrow night, still drumming away at 88! A long, wonderful day yesterday on the road from hotel to T.V. station to airport to airport again to airport again. The limo fetched me at ten and the driver had on a radio station and the song was by The Stones: “Satisfaction,” and I asked him if he had it playing each time he let someone in the car, and he didn’t get the joke, but he laughed anyway as he could see I was trying to be pleasant. It was a fine car, a Lincoln, and the water bottle and mints were fresh. I had to give “tips” during the three minute interview on WGN. I gave tips. The host was lots of fun. The station was huge, filled with studios, one of which was a place where “Bozo the Clown,” had one of many franchises. Bozo was sold as a franchise, and stations that bought the format, as WGN did, had their own actors, scripts, and so on. Here’s a link to my interview: http://wgntv.com/2013/05/20/author-scott-haas-back-of-the-house-the-secret-life-of-a-restaurant. I had thought that there would be food at the airport, but the place I had in mind was in a different terminal than the one I was exiting from so it was a matter of vodka and crackers, which is a good thing if you are hungry. By the time we reached Atlanta, the hunger had become a preoccupation and Dreiser’s, “The Titan,” wasn’t enough of a distraction, but fortunately a BBQ place had a foothold there and pulled pork and onion rings and a double gin later, and things settled down quickly. And today? MORELS arrived from a friend in Idaho who picked them on Sunday. A big box. So we’re talking morels, ramps, asparagus, risotto, and duck breast. Back of the House: Live in Chicago! Remarkably, for 10 A.M. on a Sunday, 112 people showed up to my talk at the National Restaurant Association. It was an industry crowd, and the book evidently resonated for them, which was a thrill and a comfort, since, as a relative outsider, it’s good to know that I seem to have observed and documented correctly. The questions differed from those asked at non-industry events or with media. In contrast to questions about crazy chefs and where I like to eat, the audience asked about generational differences in kitchens and among customers, and spoke thoughtfully about communication and motivation. I trolled the huge convention booths afterwards, and was delighted by the excitement and the knowledge. The Japanese booth had a fine demonstration of sukiyaki. I sat next to a man who may have expressed annoyance with my question to the chef cooking the beef about gradations. The chef had said that five exist in Japan, but actually there are twelve. It was that kind of day. Later, much later, I took a ninety minute boat tour organized perhaps by a Chicago architectural school, and learned an enormous amount about the stunning buildings that line the river. Even later I went to Blackbird: It’s a wonderful restaurant, and my friend Patricia, a very well known chef, suggested tasting menus, as it was easier than choosing, and subsequently we had perfectly plated dishes of sturgeon, hamachi, lamb, pea soup, and all sorts of wonderful vegetables. The kitchen knew her, and they had been introduced to me via the book, and so of course we were slammed blissfully. Today it’s live TV–three minutes–re the book, and then many hours in airports, which I love for the disorientation that ironically invokes reflection, and then home to the back of my house. It’s just past six A.M., and the view is of a huge crane positioned above a skyscraper going up and about five skyscrapers behind it and a white sky that reflects Lake Michigan. I’ve little idea why I came here. I am giving a talk on, “Back of the House,” for one hour at 10 A.M. at the National Restaurant Association, but given the number of its congregants (tens of thousands), the backgrounds of those gathered (industry purveyors, designers, suppliers), the time of the talk (early Sunday morning after the big party the night before), and the affiliation that the others have for one another, it’s hard to imagine who will show up and why they might care. That said, it’s certainly pleasant enough walking around this busy, unfamiliar city. Being downtown, within walking distance of Michigan Avenue, their Fifth Avenue, has, perhaps ironically, a limiting effect. I see tourists, suburbanites, employees of fancy stores, and working class families showing off the city. The deep dish pizza @ Gino’s East yesterday was delicious, but impossible to finish; the size was enough literally to feed four adults for dinner although it had been labeled an individual pie. The torta from Xoco, one of Rick Bayless’s Mexican restaurants was delicious, but unremarkable. The flavors were not distinctive, but that’s really not his fault. The cuisine he has mastered isn’t one I enjoy much. Overall, both restaurants served food that was so big it seemed to have been designed by death row inmates who wanted their last meal on earth to take so long to eat that it would delay their getting that fatal injection.